Have you ever just craved a bowl of comfort? This Dairy & Gluten Free Creamy Beef Stroganoff Stoup is just that - A bowl of pure comfort. 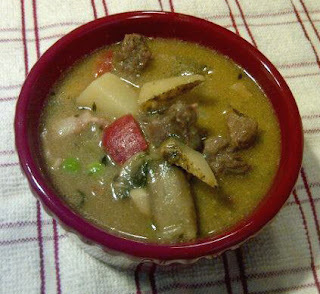 For this version of a stoup which is thicker than a soup and thinner than a stew, I included some of my favorites such as mushrooms, red bell peppers, peas, and of course beef. However, this recipe is a great starting off point to customize to suit any flavors which you might be craving. Since I have been struggling with an increase in my gastrointestinal issues which I cannot correlate to a new food allergy, I have been attempting to focus on nourishing healthful foods which satisfy both me and my husband who does not have any food allergies. Because of this, I have found that unsweetened almond milk really is a great option for making savory creamy soups and sauces. I typically rely on goat's milk to add that rich creaminess to my savory dishes; however, in an effort to easy my GI tract I have been limiting goat's milk products. In a small bowl, combine the cubed beef with the rice flour, salt, pepper and fresh thyme. In a large skillet begin to fry the bacon. Once most of the fat has rendered from the bacon add the cubed beef. Cook the beef until lightly browned, but not cooked through. Place the browned beef in a large pot and add the beef broth, Worcestershire sauce and potatoes. Bring the beef and potatoes to a boil then cover and reduce heat to a simmer. In the same pan that you browned the beef in, begin to saute the onion in the olive oil. Once the onion has begun to soften, add the bell pepper, garlic, mushrooms, salt and pepper. Continue to saute until the vegetables are cooked through. Add the cooked vegetables, dried parsley and cayenne pepper to the beef and potatoes. Continue to simmer, covered, for about 45 minutes or until the beef is tender and the potatoes are cooked. When the beef and potatoes are tender, add the frozen peas and allow to simmer for 5 minutes. Add the unsweetened almond milk and allow to simmer for 5 minutes longer or until the peas and almond milk are heated through. Taste and adjust the seasonings as desired. Top individual bowls of stoup with dairy free sour cream if desired.